I first heard about La La Land at the Toronto international film festival. A number of my friends work the festival, and the buzz had begun well before it won the People’s Choice award. So as soon as it was released, I knew I needed to see it on the big screen. And when it was nominated for 14 Oscars, that only reinforced the message. So this weekend I bought myself a swanky VIP pass and watched the film with the grownups. And I loved every single second if it. Drama is alive and well. This film is a contemporary musical. It is filled to the brim with song and dance. It’s not unusual for these characters to break out into song in the middle of a monologue. And it’s absolutely fantastic. Add the twirling camera shots and you’ve got a classic old-school musical on your hands, filled with dramatic ideas. Embrace strong lighting choices. This film was filled with great lighting. Every single cabaret table had those fantastic little softly glowing lights on them. Red and green were used as background colours, peppered throughout the film (and every technician knows, you NEVER use green lighting). And the spotlight, oh the spotlight! This film was filled with so many “fade to black and bring up the spotlight” moments. So, for your next event, consider bringing a spotlight. Remember: it’s all about that drama. Don’t be afraid of bold colours. The production designers made a clear decision about costume colours in the opening and closing sequences of this film. Every colour of the rainbow was on display. There were no jewel tones, no pastels. Just strong, bold colours. So take that and bring it back into your events. Pop colour into the florals. Or rent a bold linen. Again, it’s all about that drama! 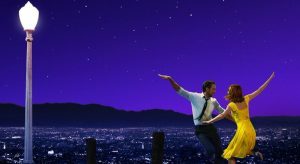 Did you see La La Land yet? How will you use inspiration from it at your next event? Check out this account for a storyboard reflecting my spark of ideas: https://www.pinterest.com/ernutting/la-la-land/ And if you haven’t gone yet, get thee to a theatre!